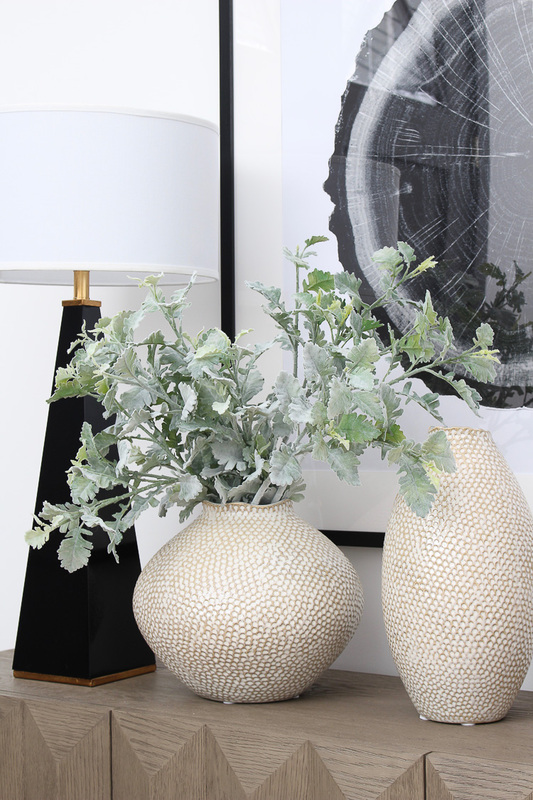 Thank you Arhaus for sponsoring today’s post. All designs, opinions and photography are my own. What makes a first impression in your home? The front entry/foyer or whatever the designated space is that your guests walk into. 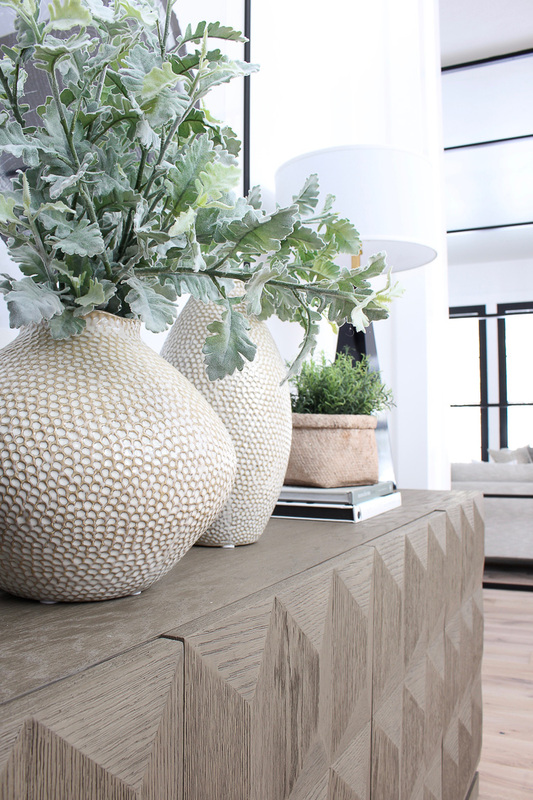 Whether it be grandiose or small scale, make it inviting with the space you have to work with. I realized I’ve never fully shared our front foyer with you. It’s been a work in progress and probably a space that will be evolving with the seasons by switching out accessories and greenery. With spring upon us and summer anxiously soon to follow, I recently spruced up our foyer with a look that will take us through summer. Affiliate links used. See our disclosure and photo policy HERE. One of my favorite stores to shop is Arhaus. 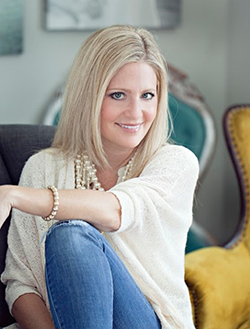 When they reached out to me recently to partner with them on a spring refresh I was so excited to work with a brand that I’ve shopped and trusted for years. They have a wide selection of beautiful furniture, lighting, rugs, decor accessories and more. I’ve found the quality of every piece of furniture I’ve bought from them to be top notch and stand the test of time. 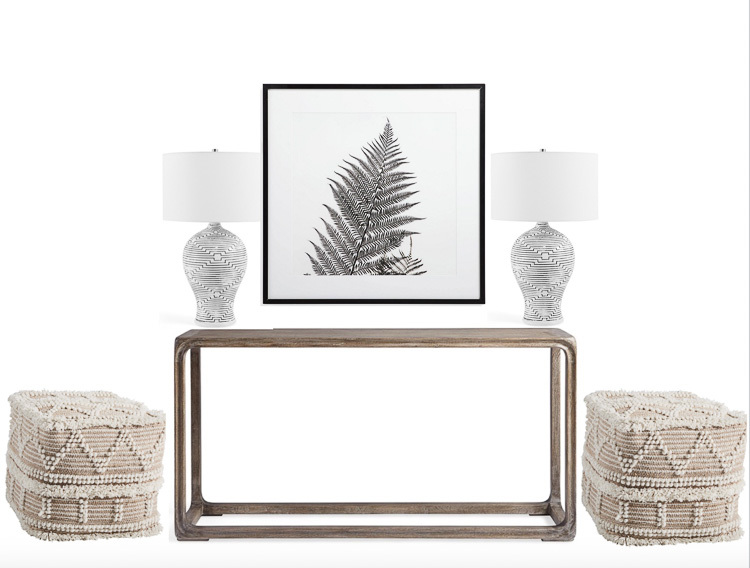 I recently visited a nearby Arhaus (#swoooooon) and hand selected a few new beautiful decor pieces to make our foyer feel fresh and have all the feels of warmer days to come. Since we moved into our home last summer, I’ve taken my time designing our formal front entry. I love having lamps as ambient lighting. 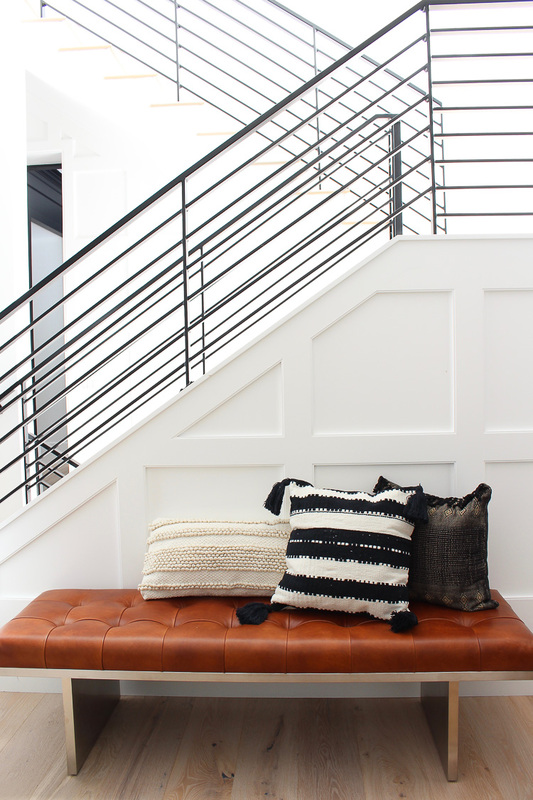 A key design element in an entryway. Also, a bench and basket to sit and take your shoes off. 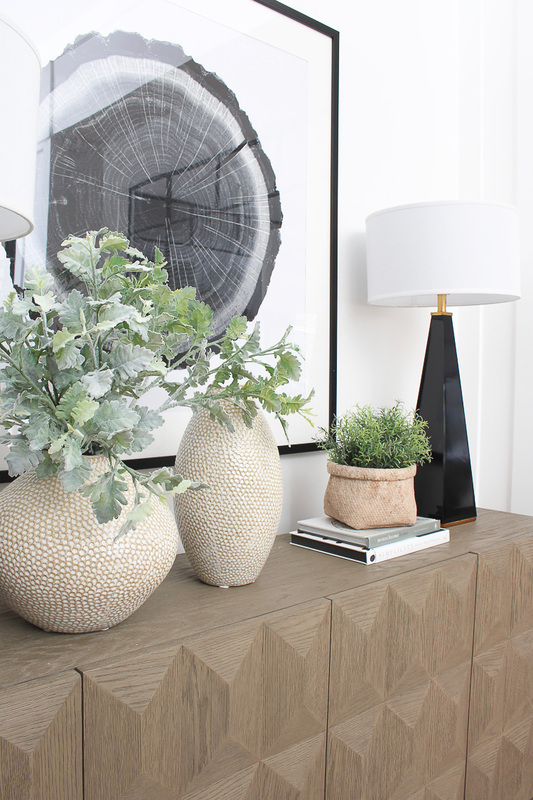 Switch out the accessories seasonally with vases filled with your favorite greenery or flowers. 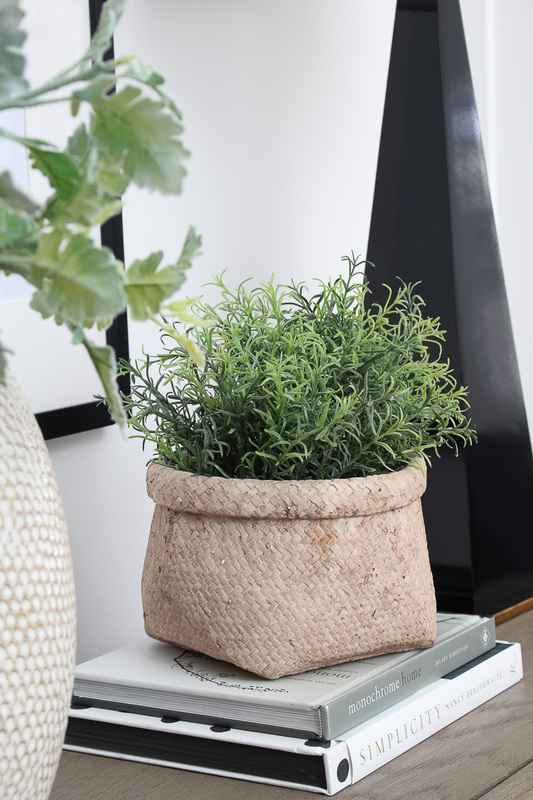 I happen to love a more organic feel and am drawn to natural grasses, succulents, rosemary and other natural looking elements. 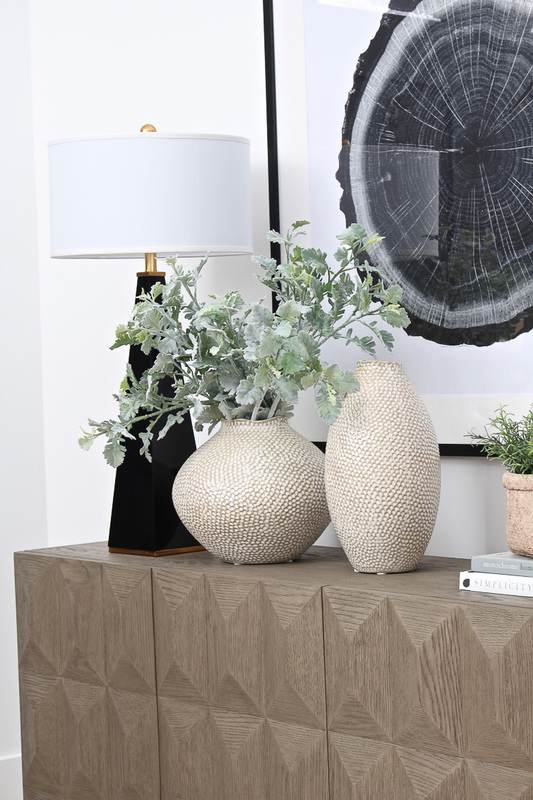 I’m absolutely LOVING the texture and look of these Eva Vases from Arhaus with the neutral tone, filled with some faux lamb’s ear stems. These are great statement accessory pieces that are beautiful displayed in a group or filled with any floral or branches. 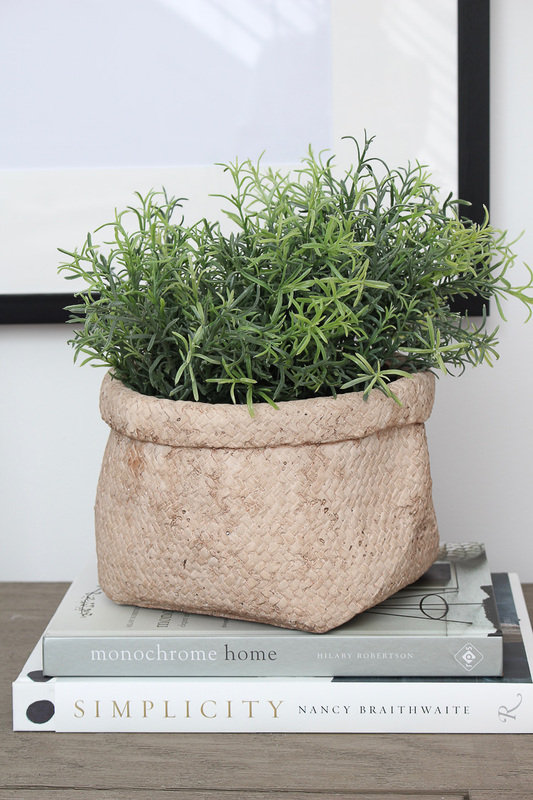 How fun is this woven planter that looks like a basket but is actually made out of weather resistant cement! Bonus when you can use your accessories both indoors and outdoors! When I saw it in store, I actually thought it was a real basket and had to touch it to feel the difference. On the other side of our entry I have a bench to allow guests to sit down and slip their shoes off or to place their handbag or coat. I added an assortment of pillows from Arhaus that have a nice organic look and feel to them. 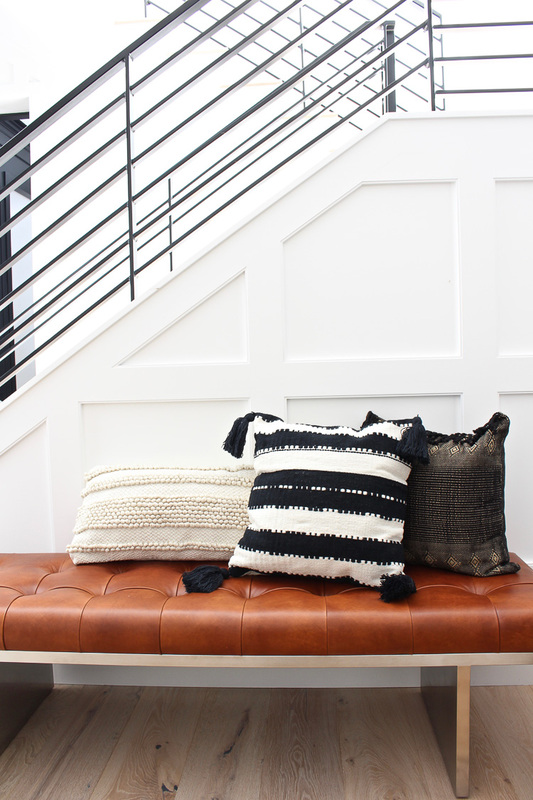 The knubby texture lumbar pillow and black striped tassel pillow are both made for indoor/outdoor use. 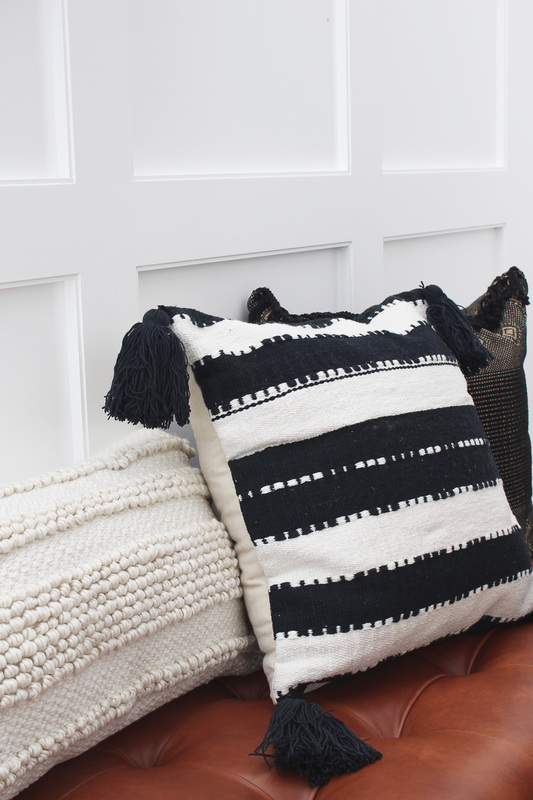 I tend to always look at a store’s outdoor pillow selection first when putting a room together because typically the price point is less expensive, yet they can be so versatile for indoor or outdoor use. 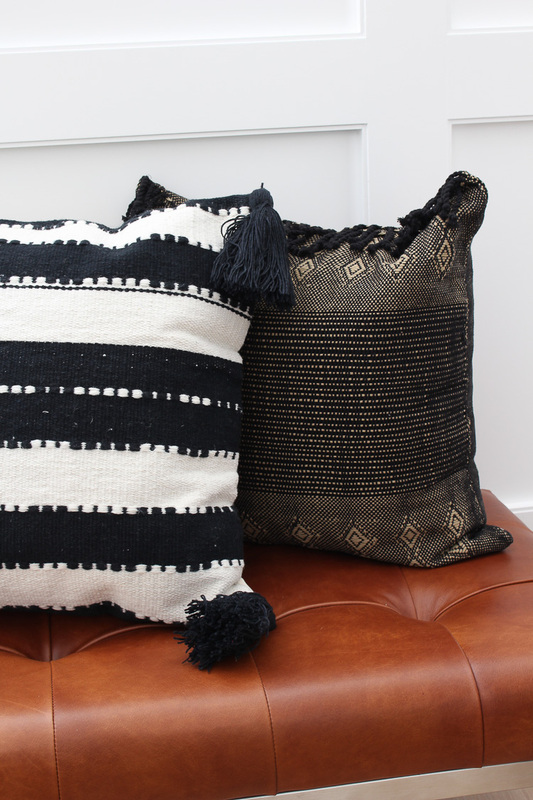 I love the mix of textures in this pillow trio combo. Just for fun, I put together this design board from a few of my favorite pieces I sourced from Arhaus. Would be great for a front entry/foyer! I hope you enjoyed a mini tour of our front entry foyer. If you are wondering about our front doors, those were custom made. Paint color is Sherwin Williams Tricorn Black. They are 11 ft tall. Explore more of our home and front entry on our Home Tour page HERE. Your house is amazing!!!! I was wondering where is your rug in front of the door from? I need it in my life! Thank you! I have a home source list on the “Shop” page in blog menu, scroll down to “The Forest Modern”. Let me know if you have any other questions! 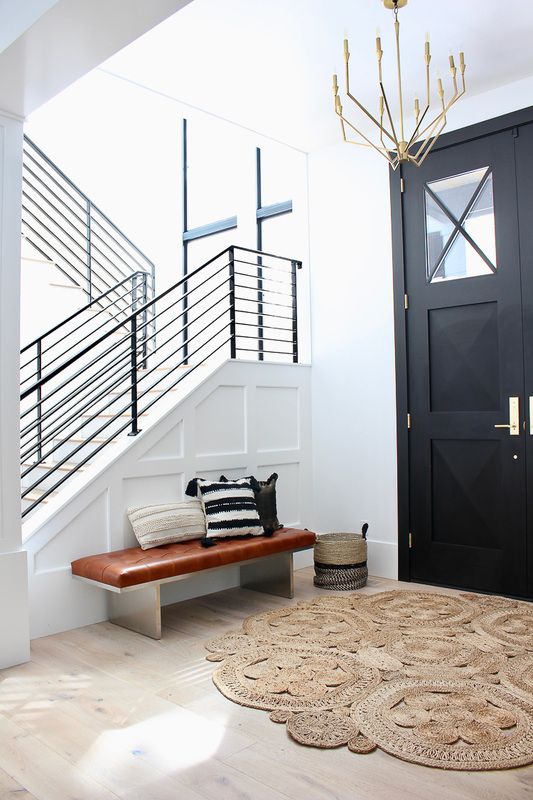 Love how your front entry turned out! Every single room you’ve shown is perfection. I absolutely love your home! I was thinking of purchasing the Arhaus console table and poufs above. I wanted to store the poufs under the table and even went to the store to see if it would work. What do you think??? Hi Amy! Thanks for the sweet compliment! 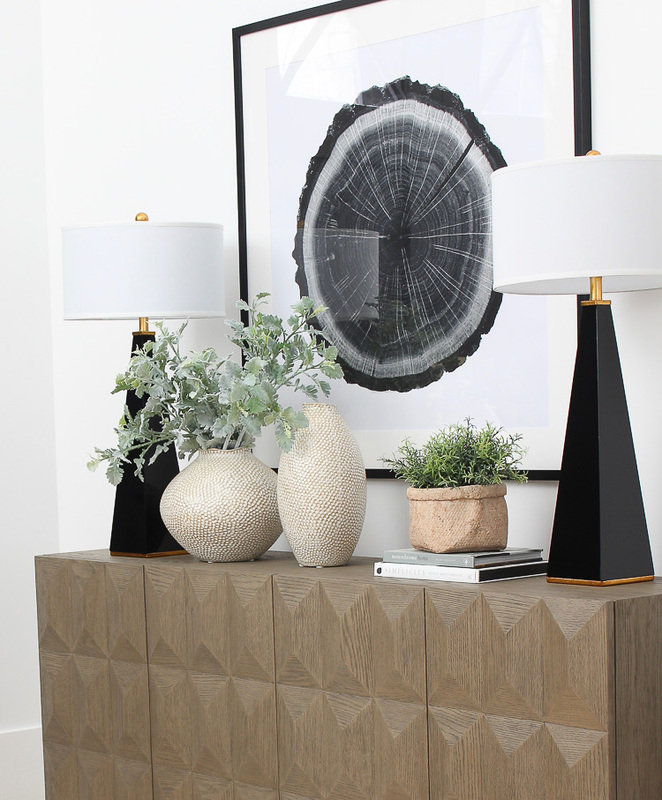 I love the idea of the poufs under the console table but I’d make sure they sit nicely within the frame of that particular piece since it is not completely open with the frame running along the floor. Make sense? Send me a photo if you get this look!